At 10 pm on Monday, October 21st, the bargaining team negotiators of the two major locals Amalgamated Transit Union (ATU) 1555 and SEIU 1021 of the Bay Area Rapid Transit (BART) system reached a tentative agreement (TA), ending the second four day work stoppage in this contract battle, which has had moments of ebb and flow over the last six months. Many of the particulars of the settlement are still not fully known, although the ratification will be voted on by next week. The rough outlines for a proposed four year settlement (the unions wanted a five year deal to align with elections for the BART governing board) included a 13 per cent increase over the life of the contract which was counterbalanced by a four per cent increase in worker contribution to their pension fund and an over nine per cent added payment towards health benefits. Depending on varied analyses, the net gain for the workers is between one and two per cent. While this ‘economic gain’ is not nearly sufficient (the union originally proposed a 21 per cent improvement, but later called for a 13.5 per cent advance with less payments into the pensions), especially taking into account the inflationary rate of 2.5 per cent in the Bay Area in recent years, it was something of a standoff from the regressive proposals initially put forward by management and their false projections of the average pay for BART workers. 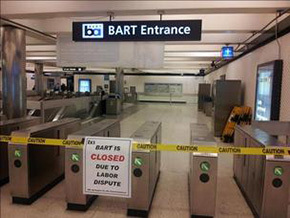 The interesting fact is that the general parameters of the ‘money issues’ which the BART management maintained was the stumbling block to settlement (despite a projected $125 million annual surplus in the operating budget over the next decade, which management says is needed for capital expenditures) were agreed upon by mid-week before the strike. At the last minute on Thursday, management lobbed a bargaining handgrenade, demanding major changes in work rules, which involved work schedules, breaks, job location and overtime. In addition, the same segment of the contract also related to safety issues, promotions, and seniority. This provocative assault reflected both short and long-term conflicts with management and strategic problems for the BART unions. Without going into extensive detail on the more overt economic items, it is worth noting that recent bargaining, especially in the public sector strongly connects with pension restructuring (California state workers and teachers just had a two-tier system imposed on their pension systems). Secondly, health care benefits continue to be a point of vulnerability for workers short of a single-payer system; things are likely to get worse for union healthcare plans under the Affordable Care Act (‘Obamacare’). But the BART battle went beyond these common themes; this attack on another critical component of the public sector workforce was about imposing a definitive defeat on labor. 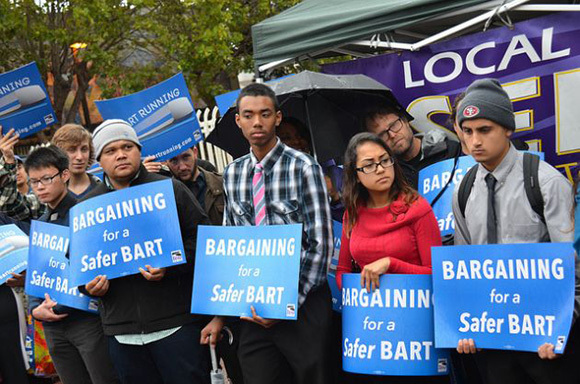 The unions correctly claimed that BART management wished to provoke a strike. This was not simply demonstrated in the manipulations of last week but in the whole trajectory of the management strategy over the last half year. First, there were key issues beyond the wages/pensions/health benefits troika that were/are important. One large question was as earlier mentioned, around work rules. which were referenced by management even before the last-minute provocation in negotiations. While not yet fully clear, some concessions were made in the TA, likely around allowing a ten-hour day (with a forty hour limit before overtime is paid, but not a daily 8 hour boundary; this is also a safety matter). As always, the corporate press dwells on any questions of overtime pay as ‘featherbedding’. A second related area was safety issues. The BART Board posed these as economic issues around staffing. Staffing had been reduced by 8 per cent after the last agreement in 2009, which also led to an over $100 million gain by BART over four years due to take backs (interestingly, BART still had a $4 million surplus in the following year). But such safety issues were not only important to the workers but to the riding public involving cleanliness and security; assaults in stations were up 63 per cent over the last several years. But even here there was controversy, remembering that Oscar Grant was killed by BART police at Fruitvale Station in East Oakland. Ironically, it was a safety tragedy that helped resolve the immediate conflict. 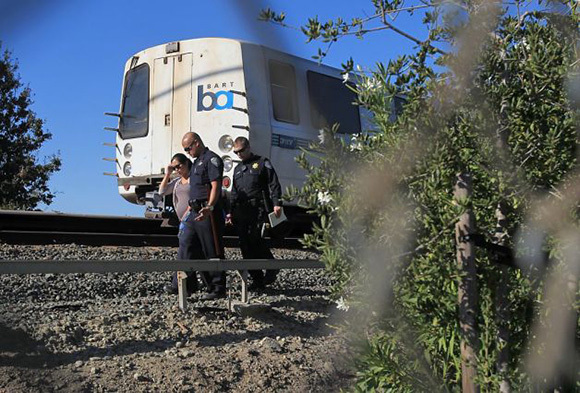 On Saturday, October 19th, a day after the stike started, two BART employees, one a contractor and the other, a rail inspector who was a member of AFSCME 3993 (the smallest BART union which was not on strike but called on members to honor the picket lines) were struck by a train in operation. While both men were actually scabbing (ala the mythic rail disaster with Casey Jones), they were tragic victims of the BART management’s reckless policy. After initially lying about the train, saying it wa on automatic control and simply moving cars, management was forced by federal investigators to admit that the train was operated by a novice manager learning to run trains (potentially later with passenegers) if the strike continued. This turned into a PR disaster for BART management and the Board. But the large strategic question was how to build a major organizing campaign in the recent months to ready for the fight which was inevitable. As mentioned, the unions acknowledged that BART officials did not wish to bargain for a real resolution short of smashing the unions. Not only did the BART Board play little leadership in discussions, their General Manager, Grace Crunican, was rarely at the table. That left the head negotiator for the bosses’ bargaining team as the central figure in its ‘non-bargaining’ strategy. This in itself should have told the whole story. This figure, Thomas Houk, not only was paid over $300,000 for his ‘services’ and went on vacation for two weeks at the start of the 60 day cooling off period mandated by Governor Jerry Brown, but is an executive for the French multinational firm Veolia. Houk, the head of the transport segment of Veolia’s North American affiliate, runs fifteen transport systems. They privatized such transit operations in New Orleans and provoked strikes in Tuscon, Las Vegas, and other cities. 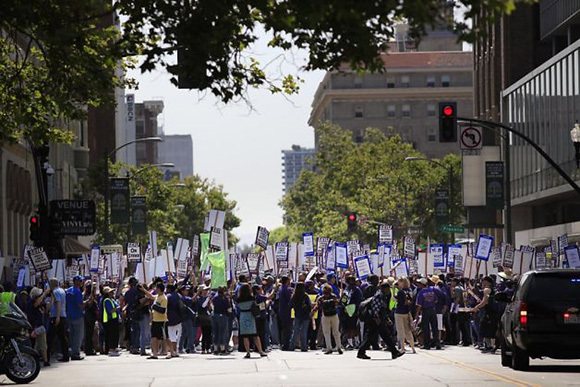 In short, they are union-busters and privatizers par excellance. There is some thought that BART is already subcontracting work with Veolia. Despite facing such a formidable foe, the union leaderships were sadly lacking in many respects. There was little co-ordination with the rank-n-file (or even with the bureaucracies) of the three unions. There was also little connection with ATU 192, the local representing the East Bay AC Transit bus drivers, even though they are considering strike action. The overall Bay Area labor movement did little beyond lip service (at a recent rally in late September, there were no officers of the BART locals or the labor councils). And finally, there was little communication with the public, despite the predictable frustration that was felt over stoppage of service. This included not simply the tactical matter of a regular newsletter conteracting the union-bashing of the mainstream press, or leafletting at stations. What was strategically more important was the need to raise demands not only around safety, but on fare reductions, certainly for youth, the disabled, unemployed and the working poor (also seniors who do have some reduced fares already), green transport projects, and taxation of corporate interests for mass transit, especially those involved in real estate and construction who have clearly benefitted from the BART expansion. Such demands were presented by groups like ACCE (the former ACORN), the Women’s Economic Action Project, and some left transit worker support groups; they were not mentioned by the BART unions. This battle is not over. Despite local and state representatives finally noting that BART management was obstructing a settlement, there are rumblings by some politicians and their media lackeys for legislation limiting/prohibiting the right to strike in mass transit and perhaps more broadly in the public sector, ala NY’s Taylor Law. The BART Board should be made to pay in the next electoral round, these regionally elected ‘public servants’ are actual corporate conduits, channeling public funds into a variety of capital projects which are dubious at best and often a total waste, as with the BART extension into the Oakland airport. The workers’ ability to at least hold off some of the most onerous features of the BART proposals is positive, but the onslaught in the public sector is still on-rail, full speed ahead.